Most of us know by now that resting on the right mattress is imperative to sleep health, but sometimes you might find yourself wanting to enhance the loft or feel of your mattress with a topper. Mattress toppers can increase the firmness or softness of your bed, while adding a thick extra layer of comfort as well. But how do you know which mattress topper is the right one for you? Bedding brand Latex For Less (whose mattress we have previously reviewed) crafts its mattress toppers from single-origin natural latex, promising to bring sleepers “comfort inspired by nature.” So, in this review, I’m going to test the Latex For Less mattress topper to get a better sense of which sleepers might benefit from it the most! 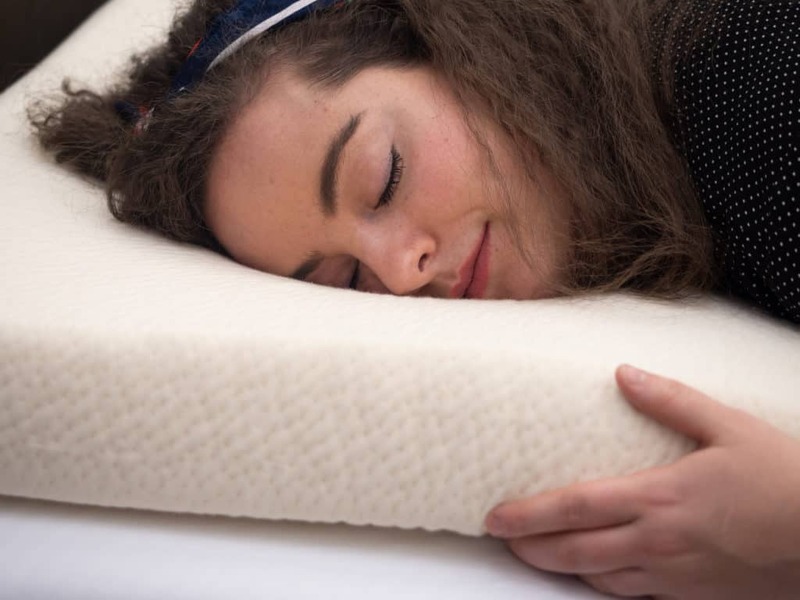 We’ll take a close examination of what it’s made of and how it feels so that you can determine if this is the sleep accessory your mattress has been waiting for. If you don’t have time to read the full review you can click here to skip to the summary! Bouncy and 100% organic, the Latex for Less bed could be great for a wide range of sleepers. Use code Sleep10 to get $100 off your purchase. WHAT IS THE LATEX FOR LESS MATTRESS TOPPER MADE OF? 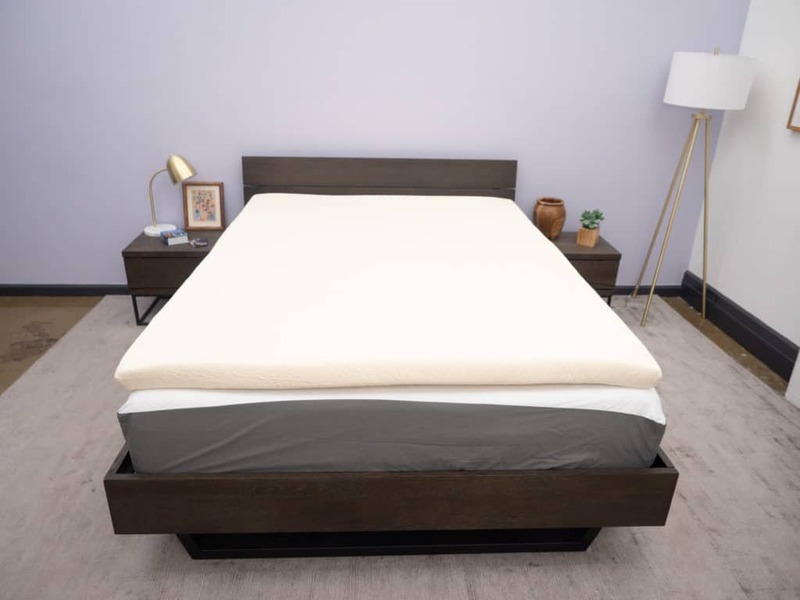 The Latex for Less mattress topper is made of 100% all natural Dunlop latex, and is built without the use of synthetic foam or petroleum-based fillers. Each mattress topper is handcrafted at the Latex for Less warehouse in Camarillo, California; and because local manufacturing reduces harmful emissions, there’s a nice eco-friendly perk that comes with this company. The topper does not come with a cover, but you have the option to add an organic cotton cover for an additional $49. You can choose your topper to be 2 or 3 inches deep, with either a medium-firm, medium, or a soft firmness level. In this review, I’m testing the 3 inch topper with a soft firmness rating. Latex For Less exclusively uses single-origin natural latex. Essentially, this means that the folks from Latex For Less travel directly to latex farmers in Sri Lanka, so they know exactly what’s going into their products. 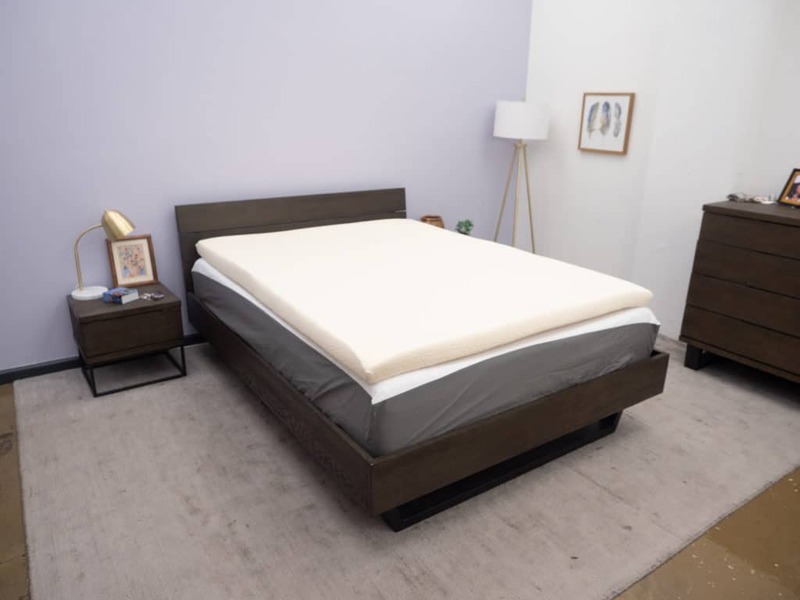 The company asserts that by using single-origin latex rather than a combination of various sources, its mattress toppers are less prone to sagging or losing shape. Because of its natural composition, this mattress topper is hypoallergenic and doesn’t off-gas as is often the case with synthetic toppers. However, natural latex does emit a bit of a “rubbery” odor when you first unbox it. It is not at all toxic, and has been described by sleepers on Reddit as a “natural scent,” but it’s worth noting that you should expect an initial odor from natural latex. As far as this particular latex topper is concerned, I found that the rubbery smell only lasted a few days. The more I used it, the more those natural latex smells were replaced by my own unique-to-me scents. All-natural latex is typically more durable and flexible than synthetic latex, or even memory foam. So, this mattress topper is designed to provide a soft extra layer of comfort that can also withstand some wear and tear. HOW DOES THE LATEX FOR LESS TOPPER FEEL? The mattress topper I’m testing from Latex For Less is three inches deep and has a soft level of firmness. So, it’s going to have a plush, cushy feel and offer balanced pressure relief. 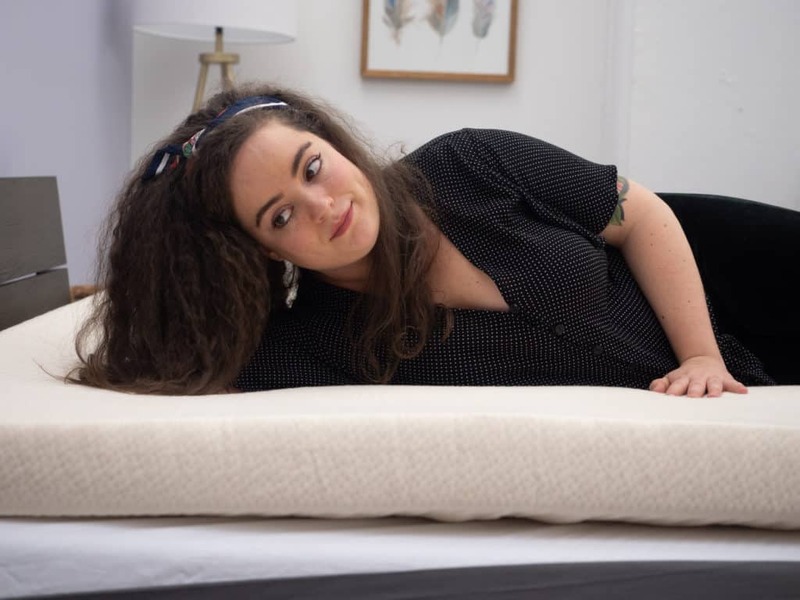 As I said, there are firm and medium-firm mattress toppers available as well, but the soft topper has more of a pillowy feel that’s meant to provide soothing relief for your body’s pressure points. The natural latex inside has a quick response to pressure, and sort of hugs your body when you lie on top of it. The folks at Latex For Less assert that using single-origin latex provides better body weight distribution as using one, consistent latex source helps keep the density of the topper balanced throughout. Personally, I did find this topper to offer even support for my shoulders, hips, and back. Fortunately for warm sleepers, natural latex tends to be more breathable than memory foam and therefore sleeps cooler. The cotton cover is also quite breathable. This topper does not come with a cover, but there are some advantages to having one. For the purposes of this review, I am using the organic cotton cover (remember, this cover is an additional purchase and does not come with the topper), and I found it to add a little extra layer of comfort. Additionally, the cover protects your topper against stains, crumbs, or anything else that might dirty your sleep space. Some sleepers may make their decision about which topper to get based on the firmness of their mattress. For example, sleepers with a firmer mattress might choose the soft topper to create a cozy balance. I’m a combo sleeper, and I prefer to keep the firmness of my mattress at a happy medium level. So, I felt that using the soft latex topper on top of my medium-firm mattress created a medium level of firmness that was compatible with my sleep style. Unlike with memory foam, this latex topper does not offer a deep sink into the material. It does have a quicker response to pressure, and comfortably conforms to your body’s shape. It returns to its original form pretty effortlessly, and this resilience is also going to help relieve pressure in your shoulders, back, and joints. I’m a sleeper who likes a very lofty mattress, so I do tend to enjoy anything that’s going to bring a few extra inches of cushy comfort to my bed. This topper in particular definitely served to bump up the plush thickness of my mattress, but there were a few things I wasn’t so crazy about. When I first unboxed the Latex For Less mattress topper, there were two things I noticed right away. Firstly, even being tightly bound in vacuum sealed packaging was not enough to dampen the resilience of this latex. The moment I punctured the packaging, I could see the topper rise, eager to escape the confines of the plastic. It was obvious that the Dunlop latex used in this topper has a quick, buoyant response to pressure. The second thing I noticed was the odor that was wafting off the topper. I’ll be honest — initially it was pretty strong. There is no off-gassing with this natural latex, and it’s not like that new memory-foam smell either. I wouldn’t call it a bad smell; it just smelled very earthy and a bit like rubber. Even though it’s non-toxic, it’s not something I want my bedroom to smell like. As I positioned the topper on my mattress, I was surprised (and pleased) to note that the smell was already dissipating. By the end of the week, the rubbery scent was gone entirely. It’s common for natural Dunlop latex to have this sort of odor at first. Still, it’s worth noting that there is a slightly unpleasant (but totally non-toxic) smell emitted from this latex topper when it first arrives. I had a friend help me put the topper on the mattress, and then settled myself on top of it. By the way: if you have a latex mattress, you might already know that latex is pretty heavy! And this topper is no exception, so I would recommend enlisting the help of a friend when putting your topper on the mattress. The King size topper weighs 68 lbs which is already rather heavy, but the flexibly floppy nature of latex can make it even more difficult to handle. Because I had the soft, organic cotton covering my topper, I decided to lie on it without even covering it with a fitted sheet. Of course, toppers are meant to be covered by the fitted sheet, but I liked how cozy and breathable the cotton felt against my skin. Plus, I was happy to have that extra layer of protection between me and the latex. Pressing into the topper, I could see that the latex was conforming to my hands, but also bounced back to its original shape as soon as I released pressure. This particular mattress topper has a soft firmness level which offered a cloud-like plushness that seemed to complement my medium-firm mattress well. It felt like my mattress was working to support my posture, while the topper gave me three extra inches of soft cushion. I’m a combo sleeper, so I began rolling around on the topper to see how it felt in each sleep style. I did find the topper to support balanced weight distribution no matter which position I was in, but thought it was particularly beneficial on my side. The soft support of the topper really helped to relieve pressure in my shoulder and hip, which helped my spine to stay in healthy neutral alignment. Lying on my back also felt very comfortable, and I felt some very soothing pressure relief in my knees and elbows. The latex doesn’t necessarily feel fluffy, but it does provide a soft, cushiony lift that offers that sleeping-on-a-cloud sensation. When I was in the supine position, I also noticed that the topper was quite breathable and was not trapping my body heat. That being said, I did find the extra layers of softness to be almost too soft for stomach sleeping. Three inches of cushy latex offered a bit too much sink for my liking when I’m in the prone position. Even despite the medium-firm mattress underneath, I felt like I wasn’t getting enough firm support to keep my posture healthy. My abdomen sort of sunk into the topper and put some pressure on my lower back. It’s important to remember that every sleeper’s body is different, and the feel of the topper also depends on the feel of your mattress. So, stomach sleepers should still give this topper a try, but just be mindful of your posture. If you feel your neck or spine thrown out of neutral alignment, you might want to experiment with different sleeping positions and accessories until you find your comfort zone. P.S. If you want to pair your latex topper with a latex mattress, check out our roundup of the best latex mattresses. Ultimately, I found this topper to be soft, breathable, and offer great pressure relief — particularly on my back and side. While I didn’t find it to be quite as comfortable in the prone position, I would still recommend that all styles of sleepers should give this topper a test run. SHOULD I BUY THIS MATTRESS TOPPER? Prefers Latex to Foam — If you prefer the bouncy-quick resilience of latex to the deep, sink of memory foam, you should give this topper a try. It conforms to your body’s form without losing shape anywhere else, and offers balanced pressure relief and weight distribution. Likes the Loft — The extra three inches of cushion might be especially beloved by sleepers (such as myself) who can never get enough loft! 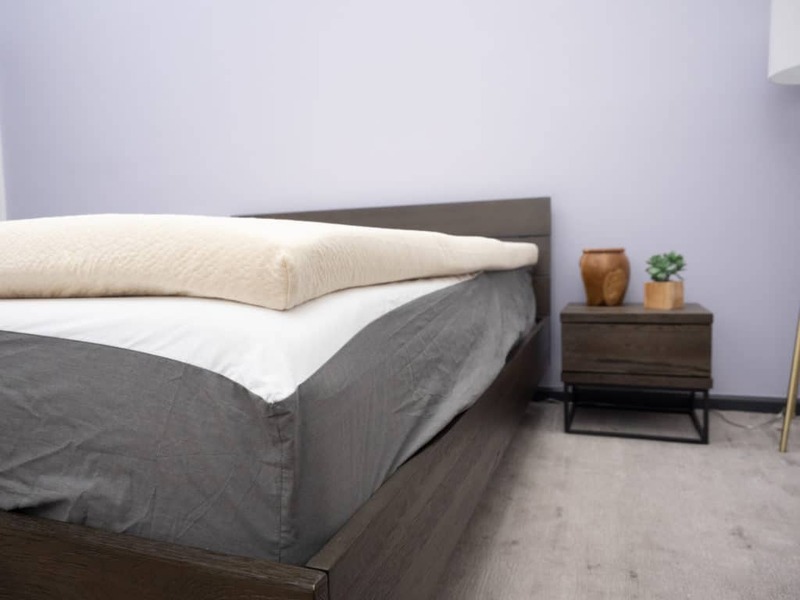 This topper comes in depth options of two and three inches, both of which provide additional layers of comfort, and increase the overall loft of your mattress. Side Sleeps — I found the soft, cushy latex to provide a plush buffer between me and my mattress which really helped relieve pressure when in the lateral position. 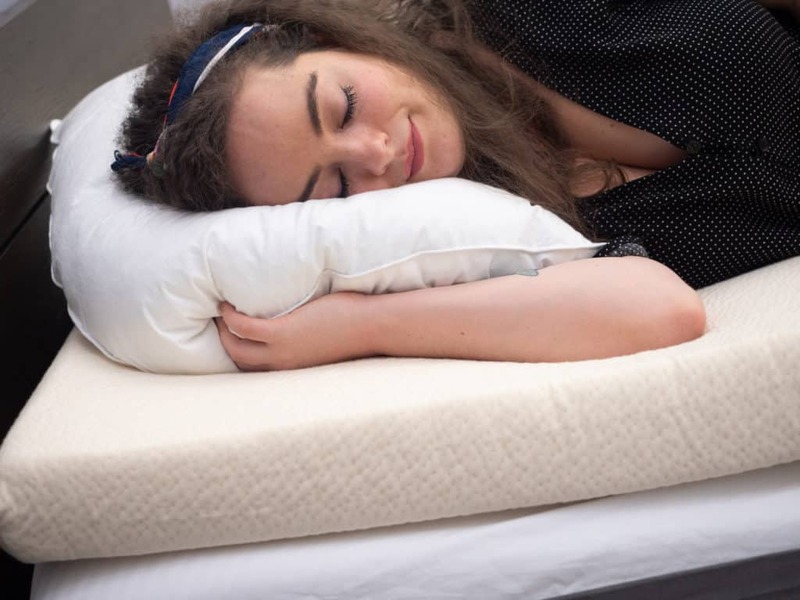 If you’re a side sleeper, you might be particularly compatible with the relief this topper offers your shoulder, hip, and lower back. Odor — The mattress topper emits a rubbery, natural odor when it first arrives, and the folks at Latex For Less say it may last up to a week. Don’t worry, it’s non-toxic, and the more you sleep on it, the more that latex aroma will be replaced by your own, personal scents. Weight — Latex is generally heavier than foam, so it can be kind of a hassle to move on and off your mattress. It’s also more flexible than a foam topper, so I’d recommend enlisting your bed partner to help you maneuver it! Cover Not Included — Unfortunately, the organic cotton cover is not included and, in my opinion, there are many benefits to having the cover. It protects the integrity of the latex, adds a layer of soft, breathable comfort, and helps to balance the overall feel of the topper. However, it is important to note that the cover is an additional purchase. Origin — The latex is shipped directly from a Sri Lanka rubber plantation to the company’s California factory. Each topper is then made-to-order in the Southern California factory. Returns & Trial Period — Unfortunately, there are no returns or trial periods on any Latex For Less mattress topper. Wash Care — To clean the topper without the cover, gently spot clean with a damp cloth and mild detergent. Let the topper air dry. The cotton over is to be hand washed only. Use mild detergent with warm water, then let it air dry.